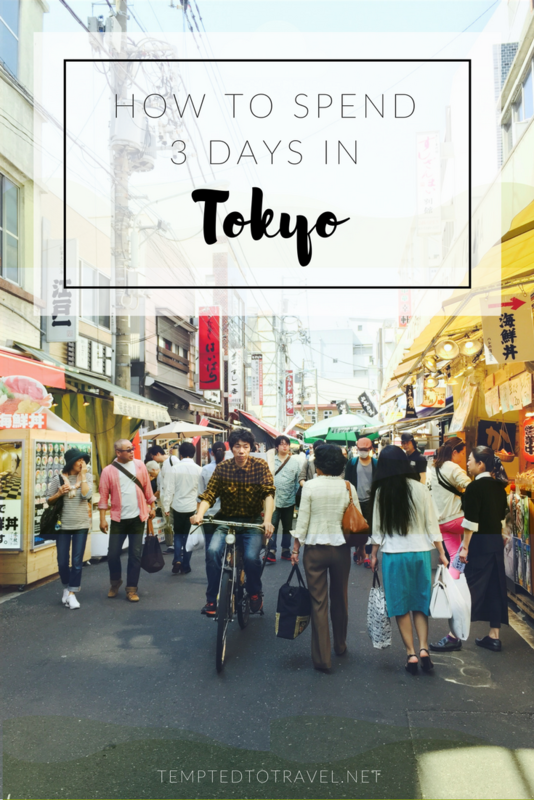 Tokyo is a city full of things to do and experience. Three days should be enough to see the main attractions, although you may be hitting the gas most of the time. Alternatively, five days would be more appropriate if you want to rest in between. I’ll be putting together this guide as if you are going full throttle mode in order to cover everything in three days! 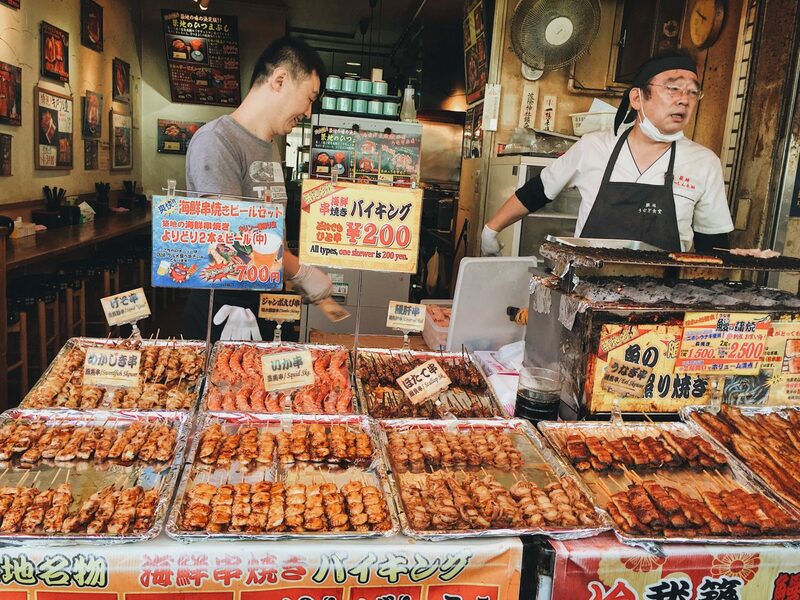 I always like to start my time in Tokyo at Tsukiji Market because there’s no better introduction than walking along alleyways filled with stalls of fresh fish for sale, street food carts exuding aromas of grilled shrimp, abalone, or scallops, and tons of little to big restaurants serving your morning sushi. While the fish market was situated in the Tsukiji area previously, it recently moved to the nearby Toyosu area due to concerns about fire hazards and hygiene regulations. Even though it uprooted its long history in Tsukiji, the new market, now twice as big, will be worth visiting. Shops and new attractions are undergoing development to enrich the Toyosu Fish Market experience. The outer market at Tsukiji, where all the food stalls are along with many restaurants and shops, remains open. It’s such a lively and vibrant place, so I recommend visiting while it lasts! Try to find a food stall called Kitsuneya for lunch, a popular gyudon place that serves two things: bowls of innards with rice or savory beef with rice. So flavorful! 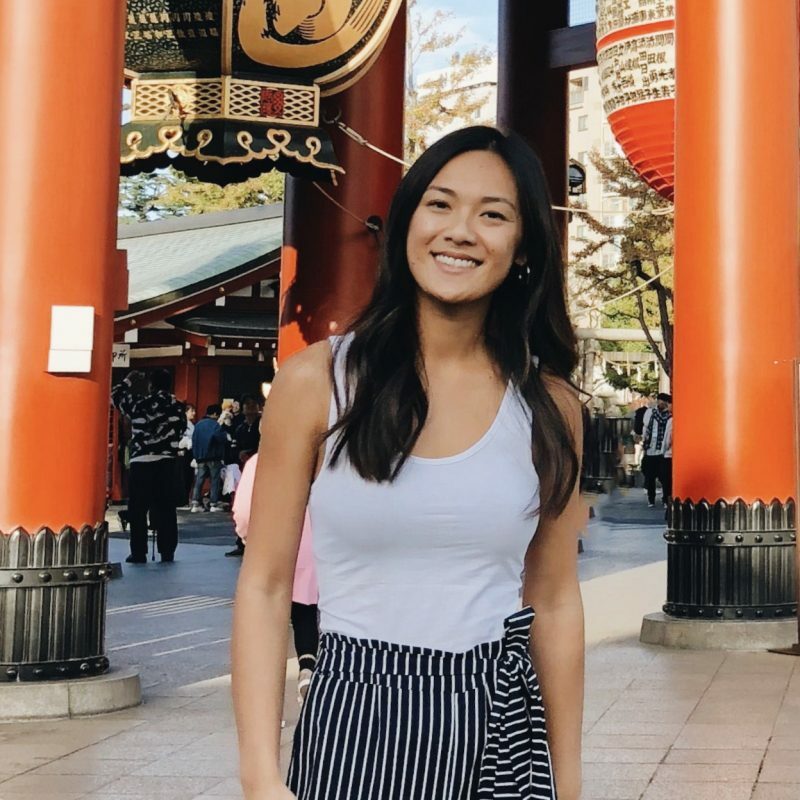 The main attraction at Tsukiji market has always been the giant bluefin tuna auction that takes place in the wee hours of the morning and only permits a certain number of visitors on days when it’s open. Unfortunately, it’s now closed in Tsukiji, but this tradition will keep going in the new location that will open in 2019. 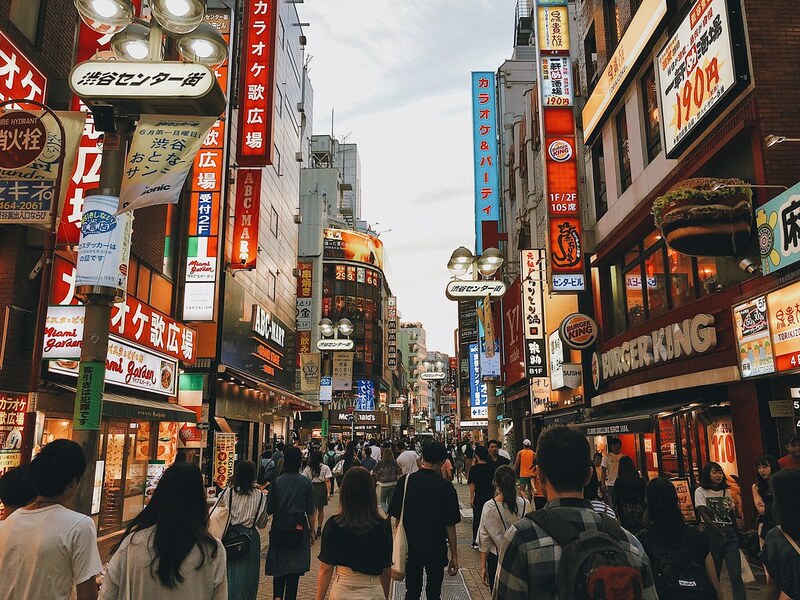 After spending half your day at the Tsukiji market, head on over to the Asakusa area where you can spend the next half of your day. You won’t miss Sensoji Temple after walking down the main street that’s filled with trinket shops and dessert stalls. Find cute souvenirs along these shops, and the beautiful temple is a must visit when you’re in the area. Walk around the temple grounds, visit the small park nearby, and say hi to the koi fish swimming around the pond. Grab an irresistible ice cream cone of matcha/green tea, vanilla, or black sesame. You can’t really go wrong with any, but matcha is a classic favorite! 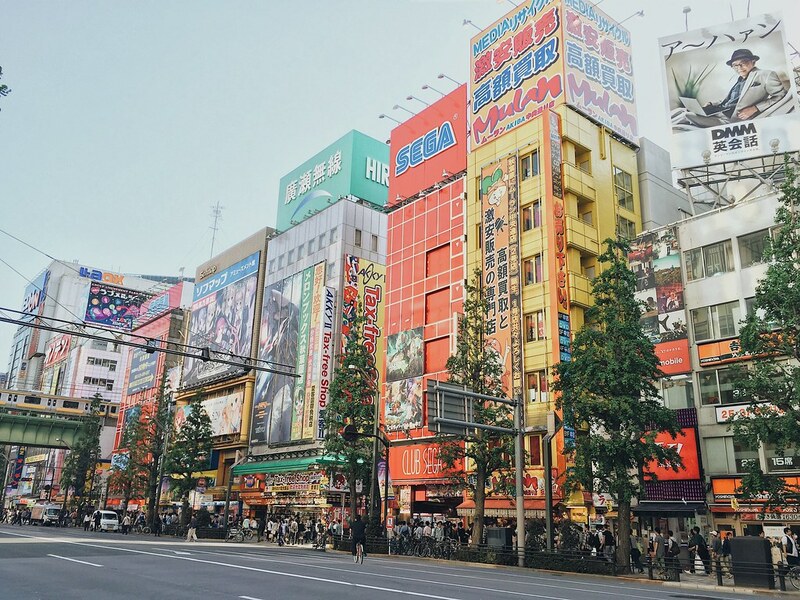 Finish your day in Akihabara, the popular electronics and gaming district of Tokyo. Even if you’re not a gamer or gadgets junkie, this area is a must-see purely for the entertainment and atmosphere. There are high rises of several floors entirely dedicated to arcades, anime, tv superheroes, etc. – unlike anything I’ve ever seen before! The Rodeo Drive of Tokyo is here in Ginza, where you can find all the designer and luxury brands to blow your wallet. Tall buildings housing levels and levels of department stores also remind me of New York’s Time Square, especially at night when illuminated by bright, flashing lights. On weekends in the summer months, the main street of the Ginza shopping area, Chuo Dori, gets blocked off from vehicle traffic and is maintained for pedestrians only. This is one of my favorite things to do in Ginza – walk along this street when roads are closed off from traffic! You can admire how pristine the street is kept, and it feels very Inception-esque strolling between tall buildings for a stretch of the road. Go to the iconic Shibuya crossing and snap a picture of yourself walking among the chaos. Be careful to not lose your friend or SO along the way (like I almost did)! There are also tons of shops here. For all the book lovers, visit the biggest of the Tsutaya bookstore chain at Daikanyama Tsutaya. Three buildings with two stories filled with books, CDs, videos of all kind, a Starbucks, and a bar lounge. Please have a bowl of yuzu ramen for me at Afuri. Yuzu is a Japanese citrus fruit, and the unique flavor is infused into many things like ramen, beer, paste, etc. It has become one of my favorite flavors! There’s a machine to order your ramen bowl as you walk into the restaurant. Bring the ticket to the counter as you get seated, and wait for your delicious ramen bowl to be served. 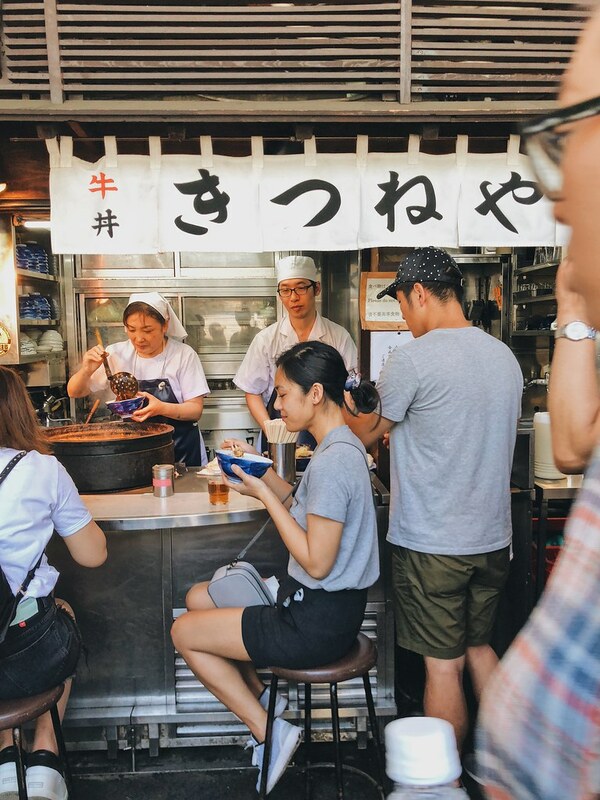 Travel back in time at Omoide Yokocho (“memory lane”), where you can eat and drink a beer at tiny, traditional food stalls or grab a couple of yakitori sticks for on the go. Little shops and restaurants with hanging red lanterns line the alleyways. Fun fact: This part of town used to be a huge black market after WWII. It was dismantled once they built Shinjuki Station, and now, this small area survived as a memory of the olden days. Chill out at Shinjuku Gyoen, a popular, large park that houses three different types of gardens: a Japanese garden, a French garden, and an English garden. Dotted by ponds and green trees, it’s a relaxing place to visit during the summer. During fall, you can witness the green transform into colorful, autumn leaves. And in early spring, the park becomes the best place to admire the beautiful cherry blossoms. 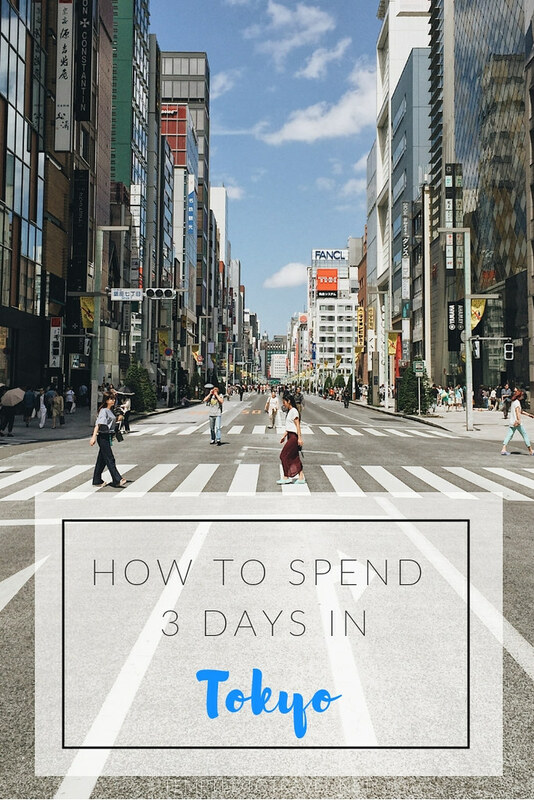 You will most likely spend half your day here in the Harajuku/Omotesando area. Come here for your chance to catch sight of cosplay and eccentric fashion. Walk the bustling Takeshita Street in Harajuku for restaurants, cafes, and fashion boutiques. Try the savory or sweet crepes at the popular Santa Monica Crepe stand (yes, a slice of LA, folks! ), and don’t miss the ice cream and/or crunchy custard stick at Zaku Zaku Harajuku. Nearby is the tree-lined avenue called Omotesando that’s filled with high-end fashion stores and luxury departments. The vibe is comparable to the Champs-Elysees of Paris. Walking down Omotesando will lead you to the entrance of the Meiji-Jingu (Meiji shrine). You’ll see a massive, brown torii gate that designates the entrance to the shrine. You’ll leisurely stroll along the forested path until reaching the main area. If you’re lucky, you can catch Shinto activities that often occur here at the shrine and maybe even a Shinto wedding like I did! Yoyogi Park should be next on the list. 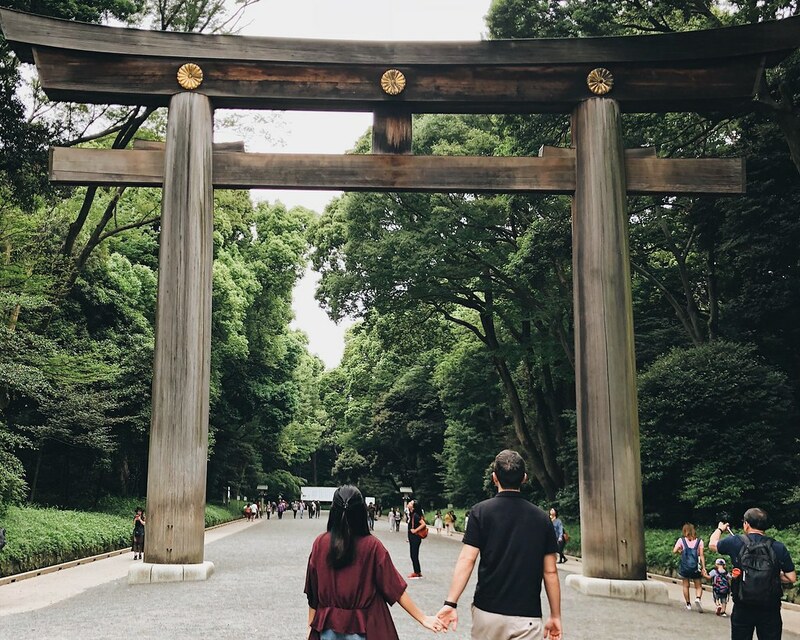 It’s an easy walk from Meiji-Jingu, and you can take some time to hang out and people watch in another one of Tokyo’s biggest parks. Locals frequently gather here for meetings, instrumental practices, or sports matches. This man-made island in Tokyo Bay provides a lively shopping and entertainment experience. You can catch awesome views from the Rainbow Bridge or the ferris wheel. Do some more shopping at Aqua City or VenusFort. Structures not to be missed include the Fuji Television building, a replica of the Statue of Liberty, and the life-size Gundam statue! Interested in science and technology? Check out the exhibits at Miraikan, Japan’s National Museum of Emerging Science and Technology. Go see the cool humanoid robots or the giant, geo-cosmos globe taking center stage that displays almost real-time global weather events and temperatures. For some entertainment, buy a ticket to SEGA Joypolis, the largest indoor theme park in Odaiba! My favorites were the human-size Mario Cart race game (yes, you actually have to do the work), and the Halfpipe Tokyo ride where you synchronize with a partner to compete with others in a “spin-battle”. Now that I’ve covered the main areas to visit, it’s worth mentioning other things to do and eat in case you have more time or want different types of experiences. 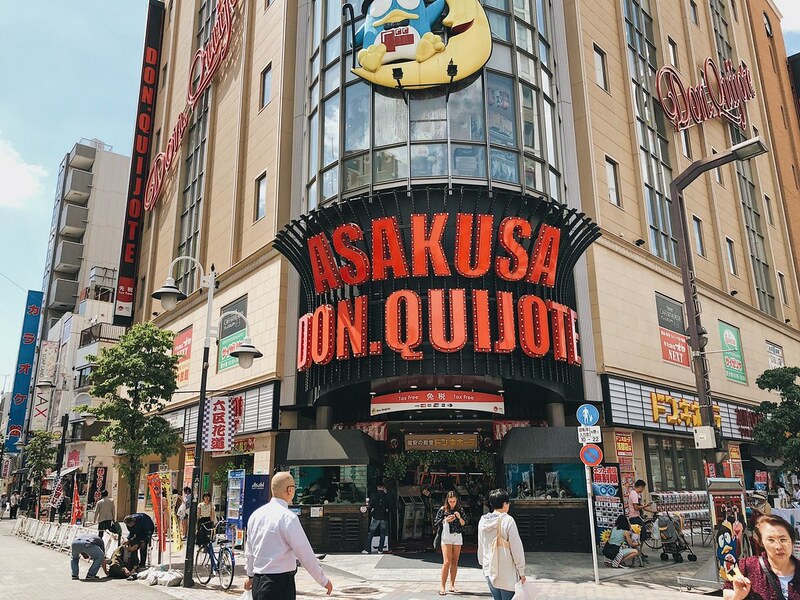 This popular convenience store chain provides the perfect place to shop for souvenirs. It offers everything at a discount from candy snacks to little trinkets to clothes to beauty products. Imagine Walmart meets the Dollar Store. We love Sushi Zanmai for its affordable but great quality sushi. It’s a local chain that you can find throughout Tokyo. Enjoy a yakiniku (Japanese BBQ similar to all-you-can-eat Korean BBQ style) meal here in the Toyosu area. The menu is all in Japanese, so you know how serious this place is. Chow down on all the galbi, beef tongue, and pork belly! Izakaya is general term for a Japanese pub or tavern that serves finger foods and alcohol (emphasis on alcohol). The setup is very casual, and you can typically find Japanese salarymen here doing some after-work drinking. Since people normally come to drink alcohol, make sure you order a few drinks and not only food, or else you may be asked to leave. Have an entire day to spare? Spend it at Tokyo Disney! In my experience, the rides and attractions are fairly similar to other Disney parks. The cool part was seeing so many groups of visitors, usually teens, dressed alike in costumes or themed outfits. Hope you enjoyed this guide! Let me know if I should add anything else to the list in the comments below.